1. Weekly trips to SanRio/Gift Gate - Before I turned 6 years old, we used to live in Caloocan. We're a quick tricycle ride away from Ever Gotesco Grand Central. At least once a week, my mom would bring my sister Paullette and me to the groceries. That means a visit to McDonald's play area and to our favorite knick knack store, Sanrio/Gift Gate. We don't always have the money to buy something for both of us so we learned to share and take turns. 2. School Girl Cuteness and Friends - My mom loves everything to match. In school, my hair tie, hanky, socks, bags, notebooks, pencils, and erasers, they all have to match. 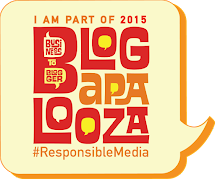 Every year, there will be one theme. It was hello kitty for my second or third grade. If I remember it right, my friends were a group of Sanrio fans, including My Melody, Little Twin Stars and KeroKeroKeroppi. 3. Avril Lavigne and my Rockstar Dreams - She recently released a single titled Hello Kitty. Skater Boy became my theme when I dated one. I am such a fan of this ageless beauty, I died when I couldn't watch her concerts. I still have a secret desire to be a cool rocker chic. Rockers can be awesomely out of tune, right? 4. My undeveloped talent for drawing - I used to love to draw. My sketch pads and grade school notebooks were full of Hello Kitty heads, copied from the stickers on my pencil case. Then I moved to other cartoons, even eye-less portraits (never learned to draw realistic eyes so either I left it blank or give it anime eyes). Life happened and I just realized I couldn't draw anymore. 5. McDonald's Happy Meal - mom said I loved Jollibee. But I remember McDonald's more. I collected lots of happy meal toys including, who else, Hello Kitty. Back in 2009, McDonald's released a collection to commemorate the 35th Birthday of Hello Kitty and her twin Mimi (did you know she has a twin?). I completed that but haven't seen it since we moved. 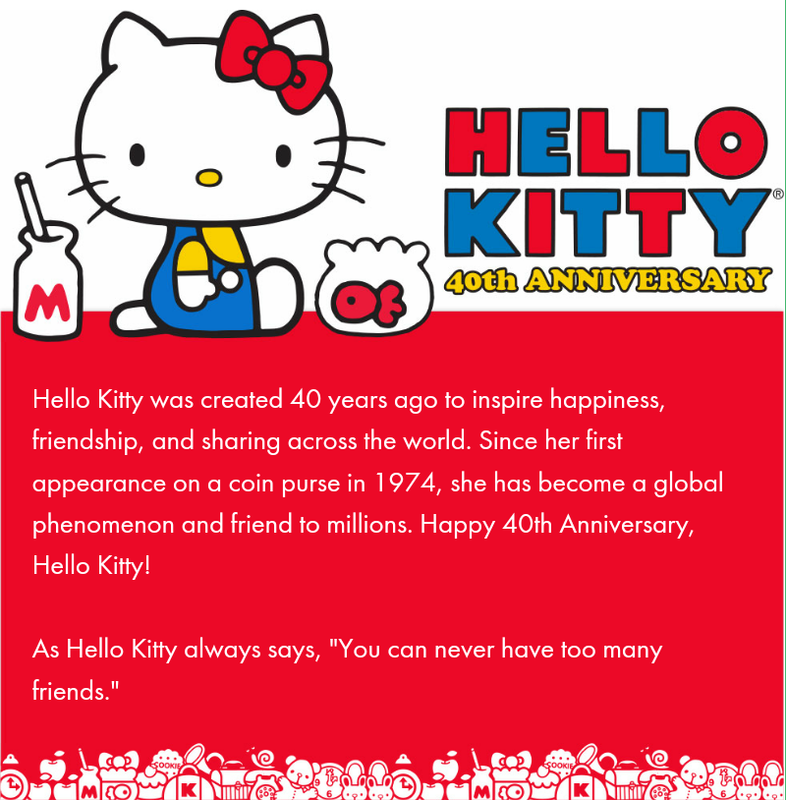 This year, Hello Kitty is celebrating her 40th Birthday. Talk about midlife crisis huh. So even if she is just confused, having an identity crisis, or it's a hoax, Cat or Girl, she will always induce nostalgia to any conversation. And lots of happy memories. For sure, old and new fans, including Mila, will always enjoy her loveable cuteness for years to come. Mila's first Hello Kitty doll. Sorry for poor pic quality. One of the biggest debates of the year. Haha. To me she's always been a cat. :) I wish they would simply leave it at that and not complicate it. Haha. It's a strong contender. Biggest revelation ever! I really love the Sanrio store in Greenhills when I was younger. But the items are very pricey! Also, while most girls like Hello Kitty, I prefer Snoopy. Hehe! I agree, items can really be pricey. I remember getting a bag and the deal was I will have to use it for two years because the price is equal to 2 bags. Hello Kitty brings back so many childhood memories. I remember going to Gift Gate in Ali Mall as a little girl. Muka naman talaga syang kitty eh tapos hindi daw. Ang gulo, mejo hindi ako fan ni hello kitty eh., hehehe. I stopped being a fan years ago pero kakagulat pa din no? Biglang sobrang big deal sa Sanrio if she's cslled a cat. identity crisis nga! 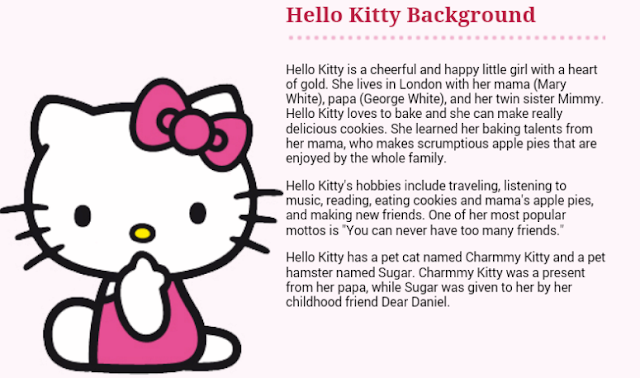 oh well, if not for my little girl, I would not know Hello Kitty and to her HK is a cat, end of discussion. Our babies always have the final say. LOL! The news devastated an office friend and "destroyed" her childhood. Hehe. Sorry, I couldn't relate - I was never fond of the cat, erm, the not-cat. She's still cute anyway and the news didn't ruin anything for me. Well, except maybe adding confusion since she apparently has a pet cat. Armf. Haha. She really has some die hard fans. And even them were blind-sided. Awww love Hello Kitty! I used to collect those tiny kitties in high school! Were you able to keep them? 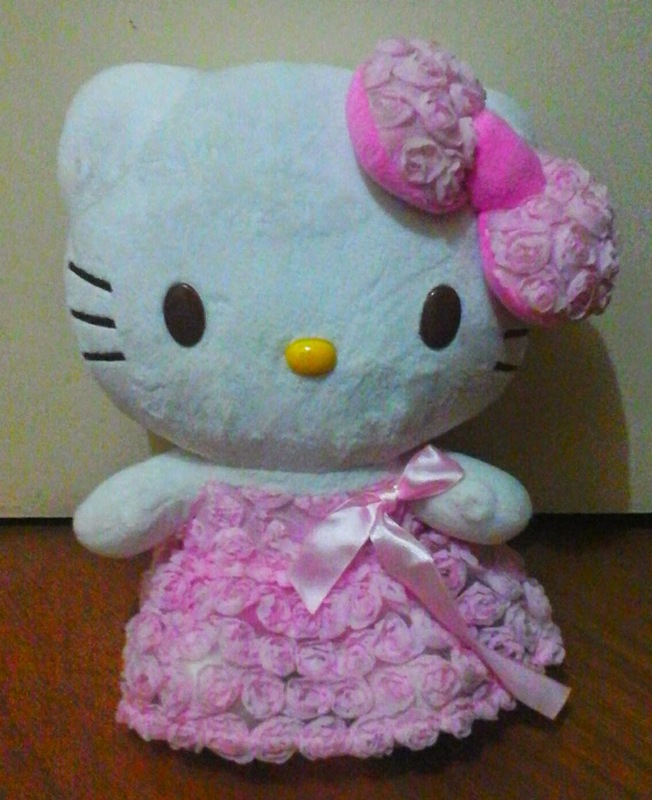 I love hello kitty but it didn't get to a point na talagang naging collector ako. mahirap na, makabutas bulsa! hihihi! Agree! Ang mahak ng original items grabe. I'm happy to know that Hello Kitty is not a cat :) I hate cats e.
Dami kong tawa. This is the most unique comment. Kaw lang happy talaga. I like Hello Kitty, she's cute, but my daughters were not fond of her so much. Maybe because medyo mas high-graphics na ang pinapanood nila. Medyo masyado na daw pang baby si Hello Kitty. I'm glad kasi HK is too expensive.